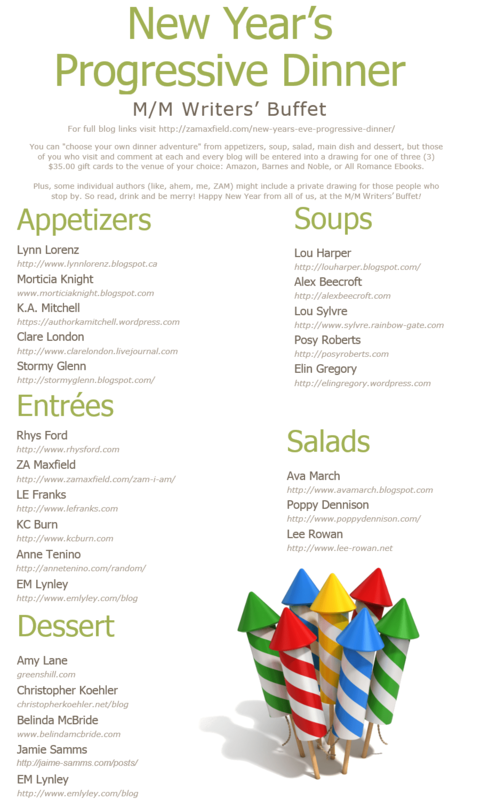 Welcome to the New Year’s Eve M/M Writers’ Progressive Dinner! 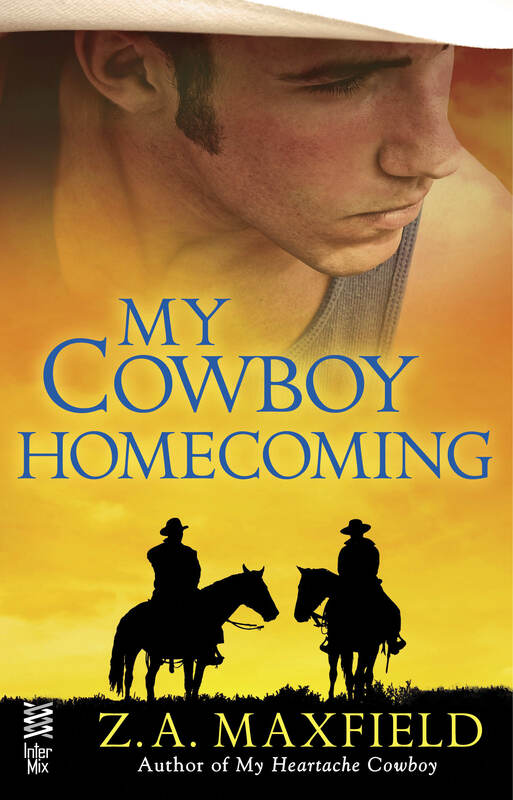 I’ll let you know more about that later, but for now, I want to share a recipe with you that I believe is something Birdie Tripplehorn from My Cowboy Homecoming would have put on the table for her growing boys in happier times, before she lost the plot and moved into her own little delusional world. I’m calling it Birdie Tripplehorn’s Pantry Chicken and Dumplings. I cooked this a lot when my kids were growing up. They adore the dish and it takes no time. I can make it from pantry staples and frozen chicken breasts whenever the mood strikes, unlike real deal Chicken and Dumplings, southern style, which I’ve never really mastered. Serve this along with a simple salad or some steamed vegetables for a complete meal. Here you go, my main dish recipe! Don’t forget to check out the contest rules and the menu below, visit and comment at everyone’s blogs. As writers, we know your time is precious, and we love that you follow our books, our blogs, and our newsletters. We couldn’t do it without you! So here’s a comfort classic right from my cupboard to yours! Heat olive oil in a large, heavy-bottom Dutch oven. Add butter and let it foam out. Lightly salt and pepper chicken breasts on both sides. Brown chicken breasts on both sides in butter and oil. Remove Chicken breasts to a plate and cover. Add onions, scraping up any brown bits. Sauté until translucent. Add tomato paste and cook for 2 minutes until it starts to smell rich and sweet. Add veg mix, stir 3 minutes or until thawed. Whisk together soup and stock and add to pot, along with bay leaf. Add chicken back to pot with any accumulated juices and cover; bring to a low boil. While you’re bringing the soup/chicken mix back to a boil, make dumplings according to package directions, which means–pretty much–add milk to baking mix and stir until just moistened like drop biscuits. This is a large amount of dumplings, but if Birdie’s boys were anything like my little tribe, they had to have some dumpling with each bite of chicken! Halve it, if you like fewer dumplings. Remove the bay leaf at this time; it’s easier to find it now. With the chicken stew at a low boil, drop biscuit mixture into gravy, one spoonful at a time on top of chicken. (Do this by dipping the spoon into the hot gravy, and then into the biscuit mix each time.) This might look like a mess. It probably will. It will, however, according to my kids, taste really good when it has finished cooking. Cook at a very low boil uncovered for ten minutes. Cover and cook for ten minutes more. 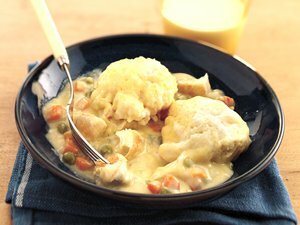 Definite winner in my book, I love chicken & dumplings!! Nice comfort food. Hi Tamika, this is a snap to make too. While I’m fond of long slow dishes, I don’t always have the time to roast or simmer all day. The New Year’s Eve Progressive Dinner has been a hit for me as I’m accumulating all sorts of new and delicious looking recipes to try, including this one. Hi Melora, I’m so glad! Enjoy! I loved the blog hop found lots of new books and great recipes in the event I ever get back on my feet and start cooking again, I just could not after three days get on Belinda McBride’s site. HELP? I’m having trouble with Belinda’s website too. The link didn’t work, and when I try BelindaMcbride.com I’m not finding the Progressive Dinner recipe. Got it! Now I have been everywhere. Thanks for the great hop! I love a pantry staples dish, but I’d have to add leavening to flour since I don’t use Bisquick. Yeah, when I have time I make dumplings from scratch. I take a little flour, salt, and baking powder, cut in butter, and then moisten with milk until they’re the right consistency, just like I would with drop biscuits. You can add herbs like thyme and chives if you want to get fancy. They’re delish. Good on you for keeping it real! I love dumplings! This sounds like the ultimate comfort food, right up there with chicken pot pie! Thank you for hosting this progressive dinner – I’m getting all kinds of new ideas for recipes and books I want to read! That picture of your recipe looks like home to me. Looks very tasty! Thanks for sharing!